Contrary to assumptions that disadvantaged neighborhoods trap children in failing schools, a Johns Hopkins University sociologist has found the opposite to be true: as a neighborhood’s income decreases, its range of educational experiences greatly expands. In Chicago neighborhoods with a median household income of more than $75,000, most students attended one of two or three schools. But when the neighborhood income dropped to less than $25,000, students dispersed to an average of 13 different schools. “We clearly show that the belief that where one lives determines where one goes to school isn’t the reality in Chicago or in an increasing number of U.S. cities,” Burdick-Will said. “You have kids scattering everywhere. Burdick-Will examined administrative records for more than 24,000 Chicago Public Schools eighth graders entering high school in the fall of 2009. The freshmen attended 122 high schools, including standard neighborhood schools that admit students from outside the neighborhood when they are under-enrolled, open-enrollment schools, charter schools and magnet schools. While just over half of the students attended a neighborhood school, one third of them weren’t attending their neighborhood school. 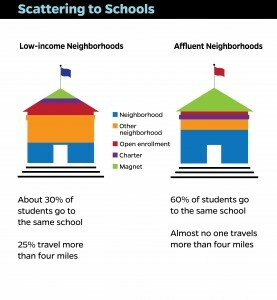 In affluent neighborhoods almost no one traveled four miles to school — the average commute was about 1.7 miles. But in disadvantaged neighborhoods, the average commute for children was 2.7 miles, with 25 percent of the kids traveling more than four miles. Ten percent of the low-income kids traveled more than six miles. In low-income neighborhoods the problem isn’t just access, Burdick-Will said, but the potential social costs of traveling far across the city every day, possibly alone — costs that don’t apply to similarly achieving students in higher income neighborhoods.